Sourcify — Hi, I'm Shubh. In 48 hours, I helped an entrepreneur win third place and get additional funding and exposure on a new app experience that allowed consumers to discover what raw materials and recyclable items were being used to produce CPG and food items in the US market. Initially, Sourcify’s purpose was to be an encyclopedia-like experience that informed what various CPG / food items contained and to serve as a catalyst for users to demand better ingredients and more benign practices by these companies in developing their products overall. After a customer discovery exercise, we found that many consumers (at Whole Foods, Trader Joes, Sprouts,) were concerned less about how these products were developed and care on three main components of concern. We pivoted Sourcify to be leaner and more revenue-centric: The app would focus only three major components of concern to consumers, and recommend alternatives to products that had these components of concern. 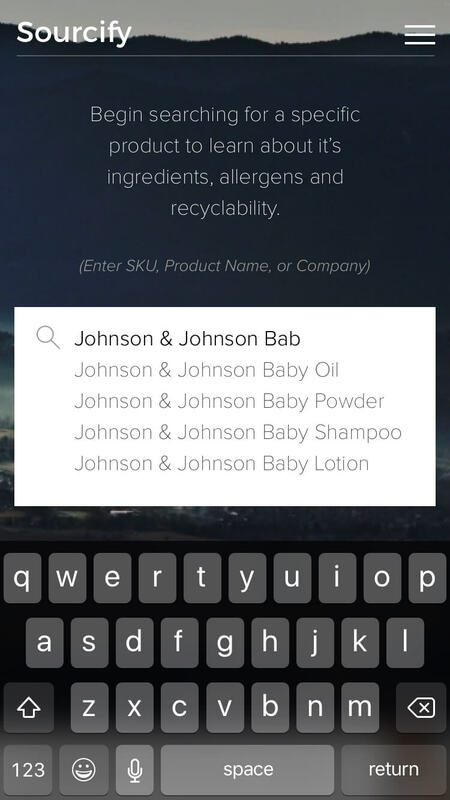 Created under 30 minutes, I designed and presented a user flow with a case study involving a user at a store searching for shampoos for her baby. To generate revenue, our strategy revolved around the notion that companies are willing to purchase data that shows why consumers buy their product or go to their rivals. As the consumer-facing app remains free, we'd hope to gain enough statistically significant information that would show industry trends and consumer preferences that companies would then purchase.